Here are the PowerPoint slides from today’s introductory Sunday School lesson on the Ten Commandments. In this lesson, I aim to cover some of the context and background information concerning the Ten Commandments, as well as the key, first commandment. One can view and/or download the slides below. Sources are listed in the presentation and at the bottom of the page. 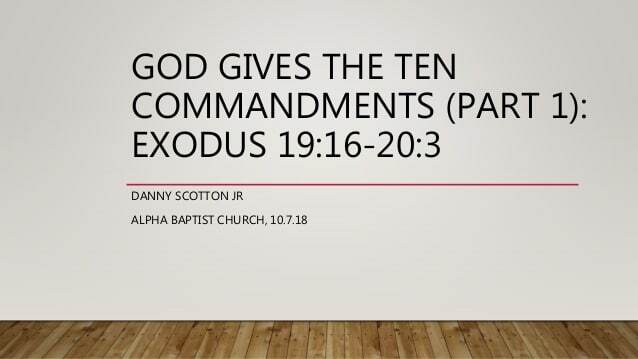 Ten Commandments Part I | Sunday School 10.7.18 from Danny Scotton, Jr.
Alexander, T. Desmond. “Exodus.” In New Bible Commentary: 21st Century Edition, edited by D. A. Carson, R. T. France, J. A. Motyer, and G. J. Wenham, 4th ed., 92–120. Leicester, England; Downers Grove, IL: Inter-Varsity Press, 1994. Allen, R. Michael. ET101 Law and Gospel: The Basis of Christian Ethics. Logos Mobile Education. Bellingham, WA: Lexham Press, 2016. Bruckner, James K. Exodus. Edited by W. Ward Gasque, Robert L. Hubbard Jr., and Robert K. Johnston. Understanding the Bible Commentary Series. Grand Rapids, MI: Baker Books, 2012. Cole, R. Alan. Exodus: An Introduction and Commentary. Vol. 2. Tyndale Old Testament Commentaries. Downers Grove, IL: InterVarsity Press, 1973. Durham, John I. Exodus. Vol. 3. Word Biblical Commentary. Dallas: Word, Incorporated, 1998. Elwell, Walter A. Evangelical Commentary on the Bible. Vol. 3. Baker Reference Library. Grand Rapids, MI: Baker Book House, 1995. Enns, Peter. Exodus. The NIV Application Commentary. Grand Rapids, MI: Zondervan, 2000. Hamilton, Victor P. Exodus: An Exegetical Commentary. Grand Rapids, MI: Baker Academic, 2011. Matthews, Victor Harold, Mark W. Chavalas, and John H. Walton. The IVP Bible Background Commentary: Old Testament. Electronic ed. Downers Grove, IL: InterVarsity Press, 2000. Motyer, Alec. The Message of Exodus: The Days of Our Pilgrimage. Edited by Alec Motyer and Derek Tidball. The Bible Speaks Today. Nottingham, England: Inter-Varsity Press, 2005. Sarna, Nahum M. Exodus. The JPS Torah Commentary. Philadelphia: Jewish Publication Society, 1991. Stuart, Douglas K. Exodus. Vol. 2. The New American Commentary. Nashville: Broadman & Holman Publishers, 2006.